It's true that you meet all kinds of people when you travel solo, but the downside is that you have precious few moments to spend with them - a few hours, generally, or maybe days if your itineraries overlap. Every time I check into a new hostel it's like freshman orientation all over again; that earnest anxiety to figure out whom, amongst all these strangers, will become your new best friend; the fast-track friendships as you condense days/months worth of getting-to-know-you into whatever time you have. Because I am generally shy and socially awkward, I find this type of bonding challenging and peculiar. I've gotten better at making new friends (I think), but for the most part it feels like a giant exercise in storytelling. The problem with only knowing someone for a short while is that it's hard to make it past all the introductory stuff. For that reason, I've told my story - about living in Paris, becoming a chef, and traveling around the world - countless times in multiple languages. I've gotten better at telling it, but I'm tired of hearing myself on repeat. I think this can sometimes make me seem antisocial and reticent, but honestly I'd much rather hear about you than talk about me. As an interactive companion to his novel The Museum of Innocence, Orhan Pamuk refurbished a townhouse not far from Istanbul's Galata Tower to open an attraction of the same name based on the premise that, over the course of his life, the protagonist collected items relating to a forbidden relationship with a distant cousin. This might seem like a vaguely egotistical move for an author, but in an age when people constantly lament the slow, painful death of the written word, we need writers who can innovate beyond the page. And besides, once you've won a Nobel prize for literature, you're entitled to do whatever you want. If you bring your copy of the novel you get in for free after they stamp the ticket printed in chapter 85 when, I presume, the character opens his museum (I haven't read that far yet). I showed them the iBook version on my phone; they stamped my journal. The three floors of the museum are an intense labor of love. Through the lens of the novel, each object (organized by chapter into different displays) relates back to that elusive woman in a kind of creepy but mostly romantic way - the handbag he bought from her store when they first met; a matchbox from a restaurant they frequented; a dainty spoon that once touched her lips. But when you think about how much the author put into the project, it's even more impressive. Up in the penthouse, sketches for various vitrines hang next to portions of the original manuscript, all of which are dated. 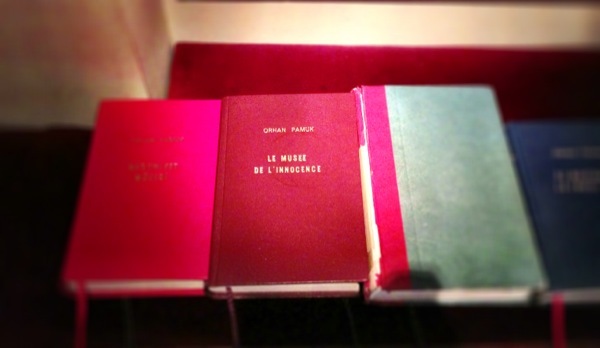 The Museum of Innocence, both the literary and physical iterations, have been a long time in the making. Although the story centers on fictional characters, because the novel is set in the past the museum is filled with all kinds of vintage paraphernalia that together create a vivid snapshot of what Istanbul must have looked, felt, and sounded like in the 1970s and '80s. The last display is an attic bedroom where, the sign reads, Pamuk sat and listened to the protagonist's account. Wait a minute, you think. This can't possibly all be real. But, then, does it really matter? That's what a good story does to you; provides an immersion so complete that the distinction between fiction and reality fade away.